Three peregrine falcon chicks have hatched in their nest in the bell tower of the Saint-Job church in Uccle. 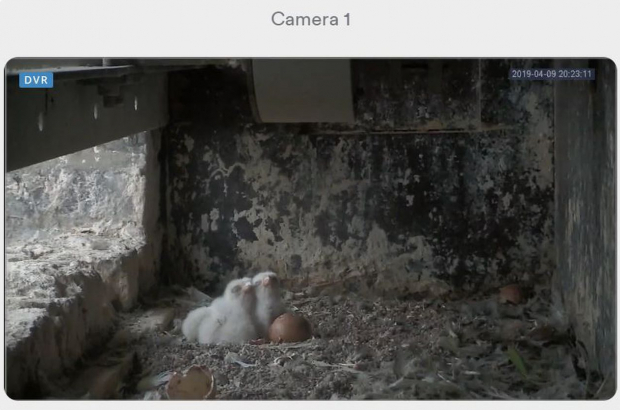 The Royal Belgian Institute of Natural Sciences maintains a live stream from the tower to follow the progress of the falcon family. Two of the chicks hatched yesterday morning within a few hours of each other. While the mother is usually perched over them protectively, she left the nest for a very short time at one point, and the chicks were then in full view. Later when the father was delivering food, and the mother raised herself off the chicks, it was clear there were three. A fourth egg is still waiting to hatch, though it is sometimes the case that they do not all hatch. There are another four eggs over in the clock tower of Woluwe-Saint-Pierre’s city hall. As the female falcon has appeared very agitated of late and is constantly turning the eggs, experts expect them to hatch anytime. And what of the cathedral? Brussels’ oldest brooding pair of falcons, which mate for life, can usually be found in the bell tower of the Saint Michael and Saint Gudula Cathedral in the city centre. They have returned there every year since 2006 but had not returned this year, leading scientists to believe that perhaps the female, who is 17 years old, had died. But last month she was found injured on the ground about a kilometre from the cathedral and was taken to the wild animal rehabilitation centre in Anderlecht. Three more females have been seen perched at the cathedral, seemingly fighting it out for the nesting site. Both active nesting sites can be seen via the live stream on the institute’s website Falcons for Everyone. There is also a blog in English to update the situation in all three towers.